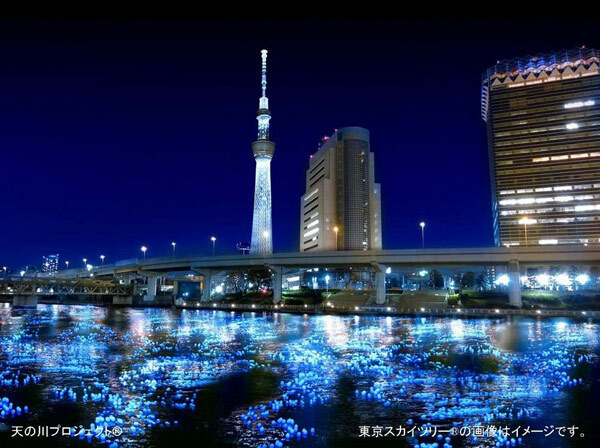 In central Tokyo, Panasonic kicked off the inaugural Tokyo Hataru (firefly) festival by sending 100,000 solar powered LED light spheres down the Sumida River. This is also pays homage to the tradition in Japan of floating candles on the water. After seeing this, I couldn't help to think of how cool it would be to see something like this in San Jose--perhaps along the Guadalupe river or one of the lakes in San Jose. After all, we are sister cities with Okayama and have one of the three remaining Japantowns in the US. Lol the guadalupe "River" is smaller than most canals and is better described as a creek. I never understood the desire make this thing a centerpiece downtown. cool pics, but that river has water in it. ours has homeless people living on the banks and a trickle of water. Haha That is so true. Im all for a river widening and clean up project, but lets be real for a moment it aint the Thames! At the very least I'd hope that the Guadalupe could become something akin to the Truckee River through downtown Reno. Alas, we're a long way from that ever happening (if it ever does). The Guadalupe River doesn't need more garbage floating in it. This is a great idea - but not likely possible in San Jose. Our climate and topography result in waterways that are more narrow and don't carry a consistent supply of water throughout the year. Also, work in the rivers is highly regulated to protect native species, plant material and channel protection. With that said, the Guadalupe River is one of many rivers and creeks in our area that define riparian corridors that can be enjoyed for biking and walking. Silicon Valley ingenuity can likely create alternative and wonderful attractions along our waterways. Follow SanJoseTrails on Twitter for more information on river-adjacent trails in San Jose.